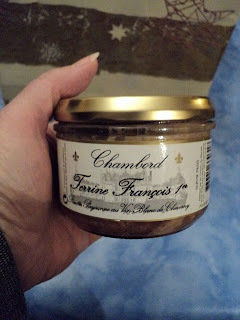 French Photo Du Jour: Meat Spread Made of WHAT? If terrine de sanglier is wild boar meat spread and terrine de faisan is pheasant meat spread, what's in terrine Francois the First? It was Ellie who verbalized the latter part of this question, and I'll admit I found the name a bit unsettling too... But upon perusing the ingrédients printed on the jar, I can assure you that there are no remains of the famous French king. There's only pork belly, pig liver, veal, eggs, onions, shallots, milk and a bit of white Cheverny* wine. Upon hearing the good news, Ellie quickly grabbed her bread. *Cheverny is a nearby castle, known for its display on the comic book character Tintin.